What happens when the rising sun invites you to come along, too? 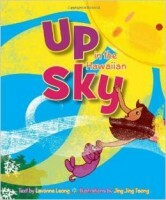 Journey up, up, up into the Hawaiian sky with the sun as your guide, meeting birds and bees, flying over treetops and airplanes, and soaring through an outstretched rainbow. Then set softly down on the sandy shore as the sun's busy day comes to an end.